A diamond and gold pin given to Deke Slayton by the widows of the astronauts killed in the Apollo 1 fire. NEWYORK - Some high-profile items from America's space program, including a signedmission checklist for NASA?s infamously unlucky Apollo 13 moon mission, will beauctioned off to the highest bidder by Bonhamsauction house this week. Theauction, to take place on Tuesday in New York, will feature over 290 lots.Objects from the Mercury, Gemini Apollo and SpaceShuttle programs will be for sale, including a patch and pin from the firstmoon landing. It comes on the 40th anniversary of the oxygen tank explosionthat crippled the Apollo 13 mission and one day after the 29th birthday ofNASA?s shuttle fleet. Somehighlights among the offerings include an Apollo11 patch donated directly by astronaut Michael Collins, command modulepilot for the first moon landing mission in 1969. Experts estimate the patchwill sell for between $40,000 and $60,000. Collinsorbited the moon in July 20, 1969 while his crewmates ? Apollo 11 commanderNeil Armstrong and lunar module pilot Buzz Aldrin, made the first manned moon landing. Alsofor sale is an emergency checklist that was used and annotated during the Apollo13 mission, NASA?s third manned moon mission, which returned threeastronauts to Earth safely after a near-fatal accident in space. An explosioncrippled the Apollo 13 spacecraft on the April 13, 1970 ? two days after launch? forcing the astronauts to use their lunar lander as a lifeboat until theywere able to safely return to Earth. Bonhams experts estimate theApollo 13 checklist, with its harrowing past, to be worth between $20,000 and$30,000. 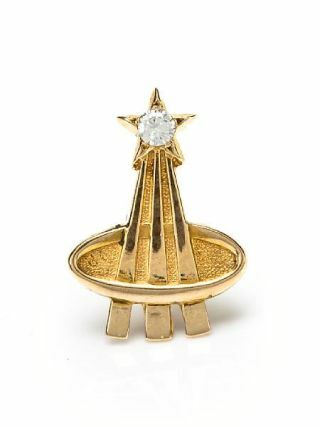 Anotherbig-ticket item on offer is a diamond and gold pin that was given to NASAdirector of flight crew operations DekeSlayton by the widows of the three astronauts who died in the Apollo 1 fire.The late astronauts had planned to give the pin to Slayton themselves, butnever got the chance. Later, Slayton lent the pin to astronaut Neil Armstrong,who took it to the moon with him during the Apollo 11 mission. This item couldsell for $80,000 to $120,000. "We'reproud to continue this annual New York auction of space history," saidMatthew Haley, Bonhamsspecialist. "The auction features items that hark back to the first goldenage of space exploration, when man sought to reach the moon, along with lotsthat celebrate what came before and after these monumental trips to thelunar surface." OnFriday, Regency-Superior Galleries will kick off a two-day auction of space andaviation stamps and other memorabilia. On Saturday, the Ira & Goldberg Auctioneerswill launch a one-day auction of space memorabilia and manuscripts. Bothauctions will be held in Beverly Hills, Calif.
What Caused the Apollo 13 Disaster?